Candidates are required to sit Scholarship Examinations in their choice of two of the subjects they intend to take at A Level at Mill Hill, followed by an interview. We will request a confidential reference from the child’s present school which we use together with the interview and predicted GCSE results as the basis to decide whether we can offer your child a place or not. 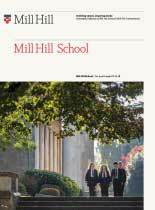 Offers at Mill Hill are conditional on achieving a minimum of 2 A and 3 B grade passes at GCSE (or international equivalent). In addition, each AS subject has its own specific GCSE grade requirements; these are set out in the Sixth Form Curriculum Guide. Up to two Sixth Form Academic Scholarships are awarded annually to candidates intending to enter the Lower Sixth Form in the following academic year; the value of these is up to 10% of fees. A number of Exhibitions of a lesser value may also be awarded. Candidates are required to sit Scholarship Examinations in their choice of two of the subjects they intend to take at A Level at Mill Hill. The syllabus for these examinations will not be more than the proportion of the GCSE syllabus which could reasonably be expected to have been covered by the time of the Examinations. Selected candidates will be invited to return for interviews a week later. Candidates for Art will be required to submit a portfolio of work on the day of the written examinations. The Winfrey Scholarship is awarded annually to a candidate intending to take History A Level, or a History component within another A Level on entering the Lower Sixth Form in the following academic year. There are a number of awards funded by external Trust Funds; the Head nominates candidates for these on the basis of the School’s normal interviews and Entrance Examinations and the reference from the Head of the candidate’s present school. McClure Memorial Scholarship: awarded to an individual of outstanding ability who in the Head’s opinion will make an outstanding contribution to the life of the School. The award is funded by Life Guardians. In celebration of the Bicentenary of the School, Governors agreed to fund a maximum of three full Bursary places (100% fee remission) in the Sixth Form.